With the wedding over, we now got into vacation mode. Sunday we slept late then had lunch at Red, White and Blue. Later we shared a cab with Steve and Bonnie and went to Bellaggio. After looking around that hotel and playing a few slot machines, we split up again. Steve and Bonnie went back to Mandalay Bay while Georgia and I walked up the street to Caesars Palace. 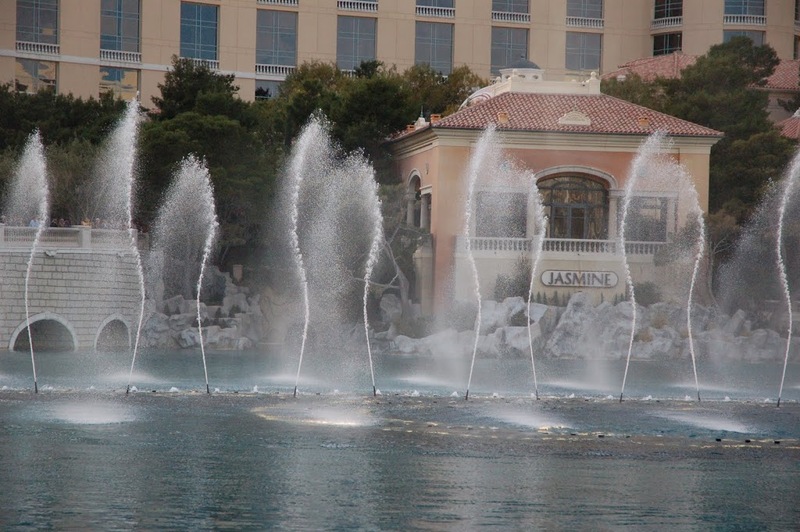 On the way there, we stopped to watch the Fountains of Bellagio. While watching the water display, we got a text from Roxie (Georgia’s other sister) letting us know that R.J.’s parents had invited all of us to dinner that evening. We let her know that we would be back in time then continued to Caesars for a quick walk through. Later we got a cab back to Mandalay Bay to get ready for dinner. We met up with everyone at Shanghai Lilly at 7 PM and had a wonderful dinner and social evening. It gave us a chance to get to know R.J. and his parents better. We spent most of Monday in Mandalay Bay and the neighboring Luxor Hotel and Casino. The two are connected by a walkway making it easy to move between them. We met up with Steve and Bonnie in the Luxor Casino and spent a couple hours playing slot machines there. Then we walked back across to Mandalay Bay to say goodbye to Kristina and R.J. who were leaving that afternoon.By the end of the day we had also said goodbye to the rest of the family since we would be leaving for the Grand Canyon at 6 AM the next morning. By the time we got back, everyone would be gone. Monday night, Georgia and I went to the Rio Hotel to see Penn and Teller. It was a great show that we really enjoyed. Afterward, we hurried back to our room to try to get at least a little sleep before our long day on Tuesday. We were in the tour lobby of the hotel at 6 AM Tuesday waiting to be picked up for our bus tour to the south rim of the Grand Canyon. The shuttle was a little late but we were picked up in time to get to the main bus terminal and were on our way to the canyon by 7:15. After a rest stop in Kingman, Arizona and lunch in Williams, we arrived at the park in the early afternoon. 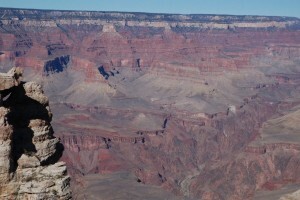 The tour makes two stops within the national park. We got our first view of the canyon from Mather Point and it is a truly spectacular sight. The park has done a good job of making most of the viewing areas wheelchair accessible so Georgia was able to get around easily with her scooter. The second stop was at Bright Angel Lodge. 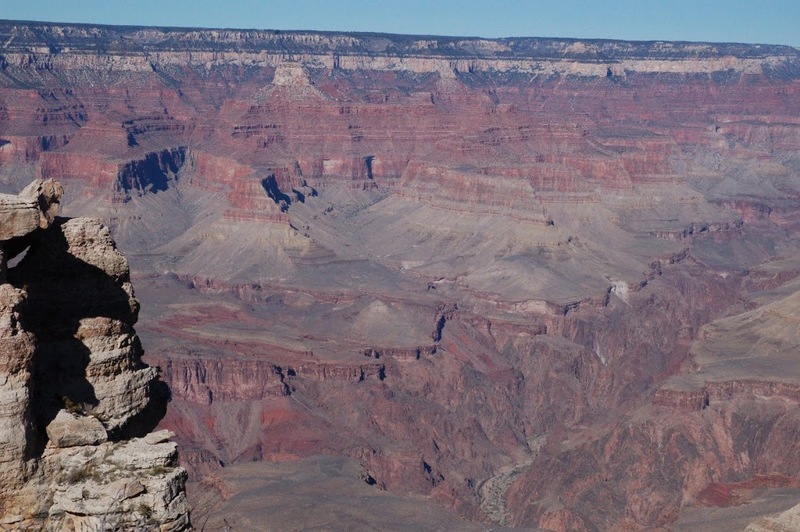 Here we could do some shopping and get even more amazing views of the canyon. 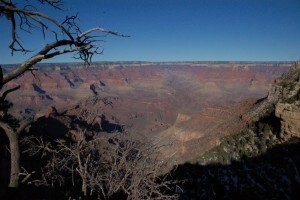 This is also the point where walking and mule tours start down along the Bright Angel Trail. We didn’t attempt any part of the trail but stuck with the view from the rim. All too soon it was time to get back on the bus for the return trip to Las Vegas. One more stop in Kingman then a quick view of Hoover Dam from the new bridge before the lights of the city came into view. We were back in our room by 9 PM. Time enough to pack and rest up from our long day at the Grand Canyon. Wednesday morning we got a cab from the hotel to the airport at 7 AM. Our flight didn’t leave until 9:50 but we wanted to allow extra time just in case we had more issues with the scooter. This time though, everything went smoothly. The American Airlines counter agent did ask about the batteries but he just took a look at them, commented about how small there are and said there was no problem. The TSA got us through with only a cursory inspection and we we at the gate with time to spare. We were allowed to board early so Georgia drove the scooter to the aircraft door where the ground crew took over and loaded it into the cargo bay. We had a mostly smooth flight home and all of out luggage was waiting for us when we go there. Another great trip under our belts. See more trip photos at http://picasaweb.google.com/tclough1/LasVegas2011#.